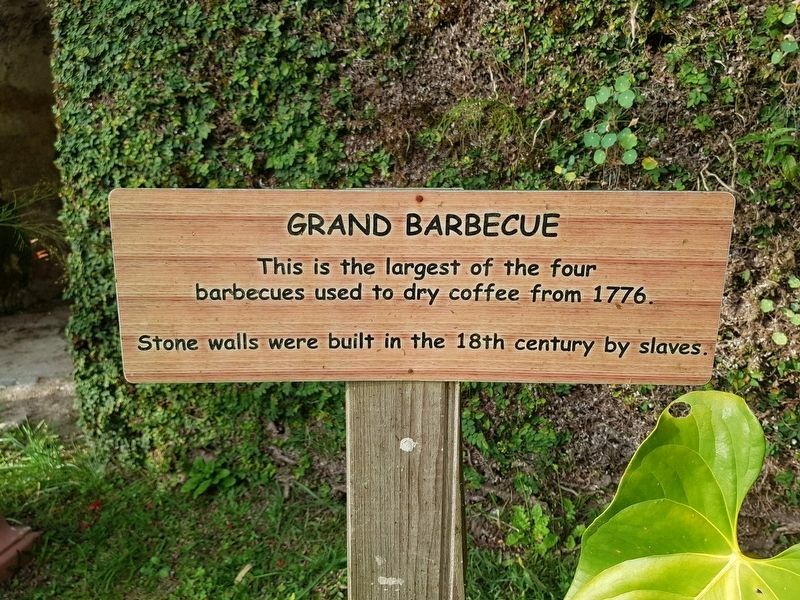 This is the largest of the four barbecues used to dry coffee from 1776. Stone walls were built in the 18th century by slaves. Location. 18° 4.344′ N, 76° 42.446′ W. Marker is near Industry Village, Middlesex, in St. Andrew. Marker can be reached from Route B1, on the right when traveling north. Touch for map. The marker and ex-estate are about 1 km before the Newcastle military installation on B1, traveling north from Kingston. Touch for directions. Other nearby markers. At least 8 other markers are within 21 kilometers of this marker, measured as the crow flies. Bob Marley (approx. 9.6 kilometers away in Surrey); Rita Marley (approx. 9.6 kilometers away in Surrey); The Great War 1914-1918 (approx. 20.5 kilometers away in Surrey); 'Ye Olde Parade Bar' (approx. 20.6 kilometers away in Surrey); Welcome to Port Royal (approx. 20.6 kilometers away in Surrey); Lucas Barrett (approx. 20.6 kilometers away in Surrey); St. Peter's Church (approx. 20.7 kilometers away in Surrey); The Historic Royal Naval Hospital (approx. 20.7 kilometers away in Surrey). first introduced into Jamaica in the 1740s, most likely brought from the French island of Martinique. The 'barbecue' mentioned in the marker text refers to the large paved area in front of the terrace and current small hotel. The 'stone walls built by slaves' refers to the large wall with arched recesses covered with vegetation, also seen in this view. 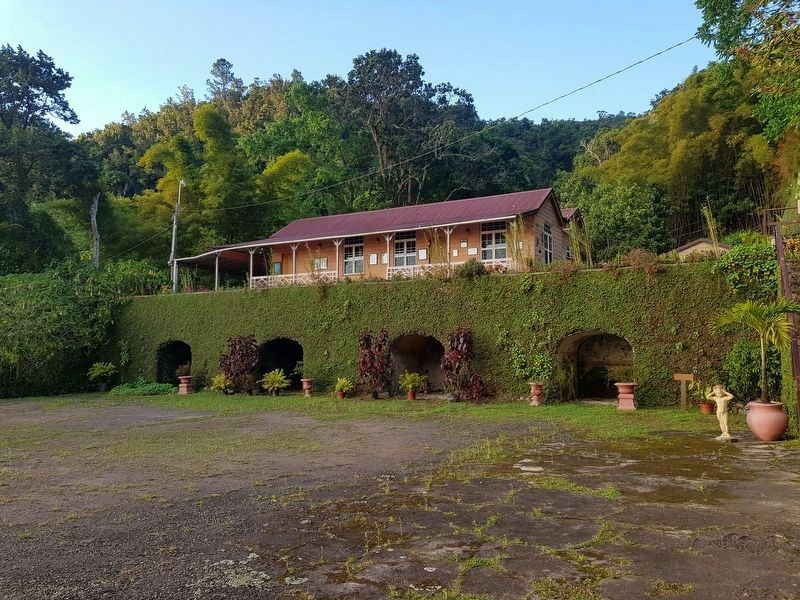 Established around the 1750's, the large Barbecues that remain, attest to the volumes of Blue Mountain Coffee which were once pulped and dried on these grounds. Ruins of the pulpery, floating ponds and works can be seen on the property. 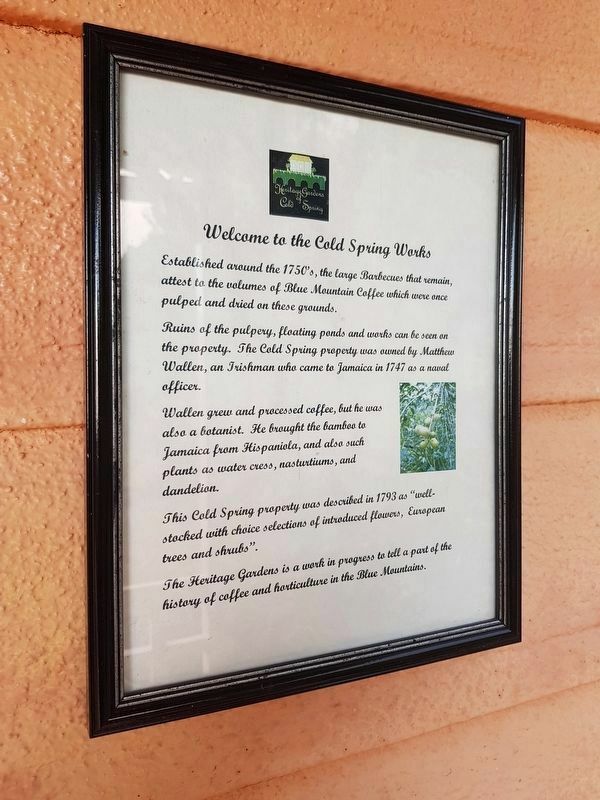 The Cold Spring property was owned by Matthew Wallen, an Irishman who came to Jamaica in 1747 as a naval officer. Wallen grew and processed coffee, but he was also a botanist. He brought the bamboo to Jamaica from Hispaniola, and also such plants as water cress, nasturtiums, and dandelion. 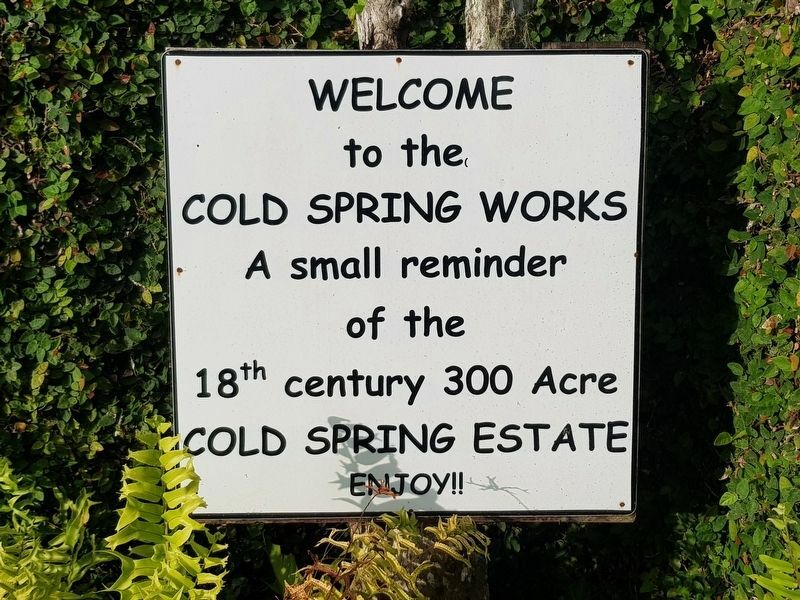 This Cold Spring property was described in 1793 as "well stocked with choice selections of introduced flowers, European trees and shrubs". The Heritage Gardens is a work in progress to tell a part of the history of coffee and horticulture in the Blue Mountains. More. Search the internet for The Grand Barbecue at Cold Spring Estate. Credits. This page was last revised on March 3, 2019. This page originally submitted on February 13, 2019, by J. Makali Bruton of Querétaro, Mexico. This page has been viewed 42 times since then. Photos: 1, 2, 3. submitted on February 13, 2019, by J. Makali Bruton of Querétaro, Mexico. 4. submitted on March 3, 2019, by J. Makali Bruton of Querétaro, Mexico.